Why are sideline banners large scale events? There are lots of answers to this question, starting with the fact that corporate sponsors require impactful signage to sell their brand -- and that calls for highly visible graphics. 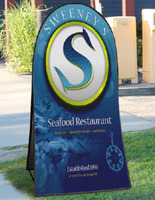 This lightweight signage is easy and fun to transport, put up, and take down! 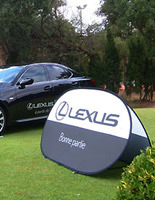 The sideline banners, also known as pop-up advertising, are flexible, unlike rigid wooden, metal, and plastic sign frames. Most of these custom printed models come with a carry bags with room for all the parts! These sideline banners are preferred by corporate sponsors because of their versatility, and the visual impact of brightly colored signs with logos and targeted messaging. Designed primarily for outdoor use, these tournament sign accessories are also appropriate for convention halls, trade show booths, and stadiums. Populs like these can be used in good to moderate weather conditions. Sizes and shapes include 39 x 59 arch, 39 x 79 tall arch, 47 x 27 oval, 58w x 28 3/4h rectangular, 78.5” x 39” oval; 78.5” x 39” rectangular; 98” x 39” oval; and 107” x 53” oval, and we are always expanding! These custom printed marketing tools have nearly unlimited gradient and color options for savvy advertisers who want to make a statement out of doors with advertising that can be spotted from a distance. 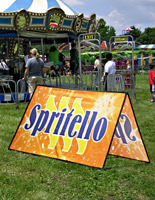 Why is this type of outdoor signage so popular with companies who do PR and serve as sponsors for large-scale events? These sideline banners are made of flexible polyester mesh that permits wind to easily pass through without tipping the unit. 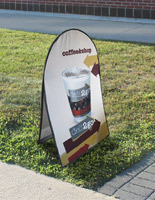 Fiberglass rods are bendable to keep signage erect in windy weather without the system toppling over. Ground stakes are constructed of galvanized steel, strong enough to be driven into the grass, snow, or dirt, so the spikes stay securely in the ground. Straps with Velcro® keep message boards secure on a hard surface like concrete or astro turf when water or sand bags are used. 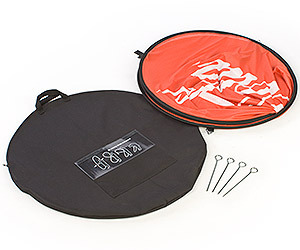 These oval, arched, or rectangular sign systems collapse and fold flat for easy transport, and fit, along with the spikes, into an attractive carry bag. Nylon and polyester pop-up stands for outdoor advertising are extremely effective at capturing attention across a large venue. This makes polyester banners perfect merchandising tools for a charity or youth organization, or a sports tournament where effective public relations and messaging are key in getting the word out about a business event or cause. 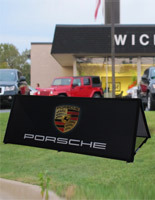 Increasing brand awareness is easy with brightly colored polyester displays that can be customized with a company logo, or a targeted message in vivid, eye-catching lettering. Influence buyers of goods and services with the right message that underscores the organization’s brand. Put your company on the map quickly with minimal effort! Custom printed signage in a portable configuration is exactly what's needed to please the sponsors for the next concert, tennis, or volleyball tournament, marathon, or convention. Cost-effective and visually stunning, these pop-ups with slogans leave a lasting impression using color + messaging! Digital image reproductions such as those used here, are preferred by many vendors because there is no restriction on graphics, giving designers free creative reign, and sales for companies a big boost!